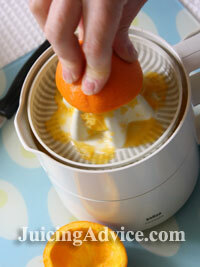 My little Braun electric citrus juicer that you can see here has been a trusted friend for probably nearly 20 years. I’m not saying it’s the best on the market as it has a few flaws that I’ll go into detail about in a moment. I didn’t buy this juicer myself it was actually given to me as a gift. In actual fact it was a gift to improve my health, as my brother was all too aware about how many colds I seemed to be getting. He thought I should boost my vitamin C levels, quite right he was too. So mine’s not the best type of electric citrus juicer but given its age and a serious amount of development in electrical gadgets since this little one was made, that’s not surprising. If I tell you the good and bad points of my electric citrus juicer it should help you discover what you need when looking to buy yours. As you’ll see from the photo mine has rather a small juicer jug, this means I can’t juice more than a glass full before it needs emptying. This is not good if you’re juicing for all the family. I have discovered the Black and Decker CJ525 and this I have to say has a perfect sized juice reserve allowing you to juice all your citrus fruits until your hearts content or you have enough for everyone. It also has the added bonus of a smaller attachment for juicing lemons and limes that’s easy to switch over. Now what I like about my model is the juicing devise is housed separately from the motor, this means you don’t get juice all over the motor body. The Waring PCJ218 also has this similar set up to mine, but it has the added benefit of a pourer spout on the front. This means it has the advantage that it will never overfill and the juice can go straight into your own jug and onto the table. Another plus point of this model is the base is made of stainless steel making it robust on the worktop and a little bit more sturdy if you happen to be a rather heavy handed. I also like the black colour of the plastic juicing parts as white plastic in our house tends to age with use. 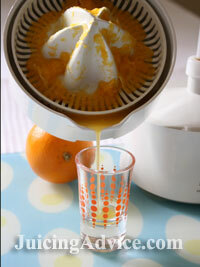 My electric citrus juicer like most has an adequate pulp strainer that separates the pips and pulp from the juice. Now I’m not really fussy about how clear my juice is, as I don’t mind the odd bit of pulp floating in my juice, actually I quite like it. But what I have discovered on the Black and Decker CJ625 is that it comes with an adjustable control that regulates the amount of pulp that goes into your juice. Now this is perfect it several people in your house use the juicer and some like pulp and others don’t. This little gadget allows you to regulate the pulp to your own taste. The main reason I’m a fan of the electric citrus juicer is they take the strain out of juicing and get the maximum amount of juice out of your fruit. I also like the fact that these juicers are easy and small to store and slightly quicker to clean up as apposed to all-purpose centrifugal or masticating juicers. I prefer to use this juicer for my citrus fruits and my masticating juicer for all the other fruit and vegetables. However the Acme 8001 citrus attachment now allows you to use one juicer for all your different juicing requirements as this attachment fits the 5001 and 6001 juicers. The attachment slows down the juicer motor and allows you to juice all citrus fruits from small limes to grapefruits without having to peel them.